Tiny Taliouine in the Souss Valley of Morocco is the hub of Morocco’s Saffron production. Have you ever tasted saffron tea? It is delicious and is reason alone to include a visit to Taliouine in your Morocco travel itinerary and is included in some of our Berber Treasures Morocco small group tours of Morocco. Saffron: Morocco is one of the world’s biggest saffron producers. Production of the exotic saffron spice, the world’s most expensive spice and currently priced around US $65 per gram, is concentrated around the small village of Taliouine in Morocco’s Souss Valley. Each autumn the flowers of the saffron plant are hand-picked and the delicate styles and stigmas carefully removed and dried to produce the dried crimson spice. You may already know Moroccans use it in cooking sumptuous tagines and other local specialities for the distinctive flavour and colour it imparts. What you may not know is Moroccan’s also use saffron to flavour tea – and its yummy so do try it; as well as a natural dye – it produces a beautifully warm and rich reddish- golden yellow – to colour yarn for weaving carpets and threads and fabrics for apparel and soft furnishings. If you try the genuine spice in your cooking you will never want to use “imitation saffron” again. If you are lucky enough to be in Morocco in the autumn there are so many reasons to be in Morocco during autumn so why not take one of Berber Treasures Morocco Tours in spring 2016 – be sure to visit to Taliouine and you may be lucky enough to see the harvest – or stop by Taliouine’s annual saffron festival – there is sure to be singing and dancing involved – the Moroccan love of music knows no bounds. 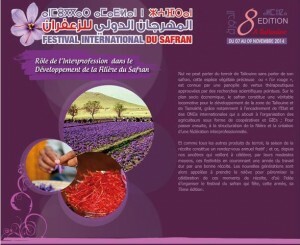 This year Taliouine’s saffron festival was held 7-10 November. Taliouine is included in some of our Berber Treasures Morocco small group tours of Morocco or included it in your Berber Treasures Morocco bespoke private tour of Morocco we will customise especially for you. You can visit all of these wonderful destinations on one of our Berber Treasures Morocco tours of Morocco. We have finally started a Facebook page. We can’t wait to read your comments, holiday posts, reviews and see your favourite photos/video from your Moroccan holiday.